Since the late 1800s psychologists have been interested in discerning the strategies subjects employ to solve psychological tests (Piaget, 1928, Werner, 1940, Gesell, 1941). Much of this work, however, has relied on qualitative observations. In the 1970s, Edith Kaplan adopted this approach to the analysis of standardized neuropsychological measures. Unlike her predecessors, Dr. Kaplan and her colleagues emphasized the application of modern behavioral neurology to the analysis of the test data. Her approach was later termed the Boston Process Approach to neuropsychological assessment. While Edith Kaplan's work generates a great deal of enthusiasm, the qualitative nature of her analyses did not allow for its adoption by mainstream neuropsychologists. However, in recent years this limitation has begun to be addressed. Clinicians and researchers have developed new methodologies for quantifying the Boston Process Approach, leading to the emergence of a new field, which is collectively termed the Quantified Process Approach. 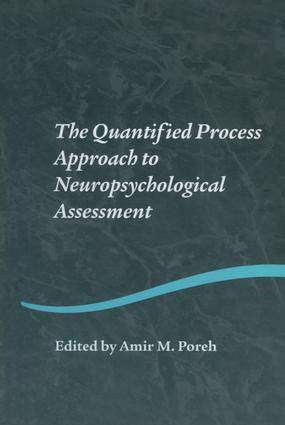 Quantified Process Approach to Neuropsychological Assessment outlines the rationale for the emergence of this new approach and reviews the state of the art research literature and up to date clinical applications as they pertain to the evaluation of neuropsychiatric, head injured, and learning disabled patients. When available, norms and scoring forms are included in the appendices.